"...virtuosic, colourful and utterly engaging ... Bate is a marvellous, bold artist, and the instrument soared." "esteemed wizard of the organ"
Jennifer Bate is in the top rank of international organists and has long been a favourite at all the world's great festivals. Many composers have written for her, inspired by her phenomenal technique and ability to bring out the colours of the organ. Jennifer gives master-classes worldwide and lectures on a wide range of musical subjects. In 1990, Jennifer's artistry and outstanding contribution to music received international recognition with the Personnalité de l'Année award by the French-based jury. She was only the third British artist to achieve this distinction, after Sir Georg Solti and Sir (later Lord) Yehudi Menuhin. In 1996, Jennifer was granted Honorary Citizenship of the Italian province of Alessandria for her services to music in Northern Italy over 20 years. 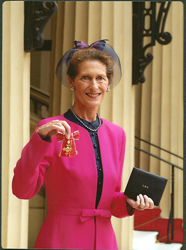 In 2002, she was elected a Fellow of the Royal Society of Arts. In 2007, she was awarded an Honorary Doctorate in Music by Bristol University and, in 2008, was made an OBE in The Queen's Birthday Honours List. Jennifer is recognised as the world authority on the organ works of Olivier Messiaen, with whom she worked extensively and became his organist of choice. Her world première recording of his last masterpiece for organ, Livre du Saint Sacrement, had exceptional international success, winning a Grand Prix du Disque. In 1995, Jennifer opened the Messiaen Festival at l'Eglise de la Sainte Trinité, Paris, where his complete organ works were performed and recorded. Among numerous awards for her CD, were the Diapason d'Or (France) and Preis der Deutschen Schallplattenkritik(Germany). In the Spring 2011 list of awards, M. Frédéric Mitterand, Minister of Culture and Communication, awarded Jennifer Bate the rank of Officier de l'ordre des Arts et des Lettres, stating that this honour is awarded to renowned artists and writers who have promoted French culture throughout the world. Subsequently, on 13 July, President Sarkozy appointed Jennifer Bate to the rank of Chevalier in the Ordre National de la Légion d'Honneur, on the recommendation of M. Alain Juppé, Minister of State and Minister of Foreign and European affairs, stating that this honour is awarded in recognition of her immense skill as an organist and her eminent contribution to making Olivier Messiaen's organ works more widely known throughout the world. 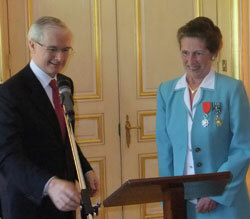 She received both awards from the French Ambassador in 2012. UK engagements have included a solo BBC Promenade Concert and Messiaen's Livre du Saint Sacrement in the South Bank Messiaen Festival (Westminster Cathedral). She has also given recitals, master classes and public lectures at Oxford, Cambridge and Bristol Universities. In 2014, Jennifer opened the first International Organ Series on the refurbished organ at the Royal Festival Hall. Her most recent London recital opened the 2016/17 Organ Series at St John's Smith Square. "Jennifer Bate's playing is immaculate and controlled and she draws some wonderful sounds from the Norwich organ. The highest praise comes from Olivier Messiaen himself who endorsed the original film To have the imprimatur of the Master himself is recommendation enough." "Jennifer Bate's fastidious approach is enhanced by the vivid tonal colours she draws from the Norwich instrument this disc is an impressive tour de force." "Peter Dickinson couldn't have hoped for a more articulate or persuasive advocate of his solo organ works than Jennifer Bate"
"The Dickinson journey is traced here in supremely well articulated and strongly characterised performances by Jennifer Bate. recorded with maximum fidelity"
Jennifer Bate has recorded for the SOMM label the complete organ works of Felix Mendelssohn (1809-1847). The five CDs comprise an incredible number of 68 pieces, from his first composition (aged 11) to his last thoughts. Among these are four fragments, which Jennifer completed in the composer's style. Many pieces are now recorded, published and performed for the first time, thanks to the research of Professor Christian Martin Schmidt, the acknowledged leading authority on Mendelssohn. The CDs were released in 2005-7 on SOMM 050-054 (mid price). Jennifer Bate recorded on six important romantic organs: the early works on the classically-voiced (Walker) organ at Wimborne Minster and the remainder, which progress to more romantic voicing on the organs of The Temple Church (Harrison & Harrison), St Matthew's Bayswater (Walker) All Saints Margaret Street (Harrison & Harrison), St Stephen's Bournemouth (Hill) and St John's Upper Norwood (Lewis). Jennifer's extensive research into the life and works of Mendelssohn was recently greatly assisted by Professor Schmidt, whose comprehensive study revealed many textural errors in previously-published scores. His new edition of Mendelssohn's organ works form three volumes of the nine new Breitkopf and Härtel Complete Mendelssohn edition. Jennifer said about this colossal project "It was a life's ambition to record Mendelssohn's organ works and so exciting that the project coincided with new research and the discoveries now published in the new edition". "...Bate's scholarly approach and fastidious playing are reason enough ... to collect the complete set." "It goes without saying that her playing is hugely impressive and impeccably stylish ... "
"Jennifer Bate has gained a justified reputation as one of the most important organists of our time ... consummate artistry ... sensitively played." "As always, Bate's restrained playing offers impeccable clarity, much enlivened when the explosive Allegro of Sonata 6's Variation 4 allows her to click into virtuoso mode." "She takes a firm hand with the music but does not miss the poetry in it - especially with regard to phrasing - and the clarity of Mendelssohn's part-writing (especially in the contrapuntal pieces) benefits greatly therefrom. Her registration in the shorter pieces never interferes with the inherent flow of the music ..."
(Sonata No 6) "Jennifer Bate sensitively brings its myriad possibilities to the listener's attention, with beautifully articulated phrasing and crystal clear control of textures." (Sonata No 2) "...abundant vitality, in which Jennifer Bate clearly revels." "As this project continues, its significance assumes greater importance... all will have to hear these records... admirers of this artist's playing will need no second bidding to aquire this disc. They will not be diappointed." "Jennifer Bate is a most compelling and persuasive advocate of Mendelssohn’s organ music in whatever shape or form it comes." International Record Review January/February 2007. "The poise and elegance of the playing will delight listeners if cause little surprise to collectors of Jennifer Bate's many recordings where such qualities may be found in abundance"
"A truly uplifting recording... beautifully mellow diapason tones, seductive flutes, mutations to die for and some striking reeds that blend deliciously. Jennifer Bate plays this charming music with wonderful playfulness and a superb clarity"
"This is first-rate. A real and rare delight. Adjectives jostle for pride of place, your reviewer quite dumbstruck. Such a happy conjecture of repertoire, instrument and performer .... the virtuosity required never obtrudes; art beautifully conceals art throughout. And there's so much more:- suductively cantabile melodies, contrapuntal wizardry, 'galant' cheerfulness, even tongue-in-cheek humour. Such a highly focussed CD has an important role to play in documentation of historic instruments and the musical literature written for them; if, as here, the mixture is also downright entertaining, we must rejoice alway." "...As a glorious celebration of the heritage of English Organ and Organ Music... This sumptuous collection cannot be bettered. Snap it up now if you missed it the first time"
"What a sound! ...A quite spectacular recording ( which ) carries the composer's imprimatur"
"Deeply committed performances…colourful playing makes first impressions that will turn listeners into pilgrims…Wonderfully majestic"
"This is surely how Franck should sound…"
In the BBC Radio 3 programme Building a Library, broadcast on 9 January 2010, the recording of Franck’s Chorals on these CDs was chosen from those of 15 of the world’s leading organists as being the “finest” recording available. 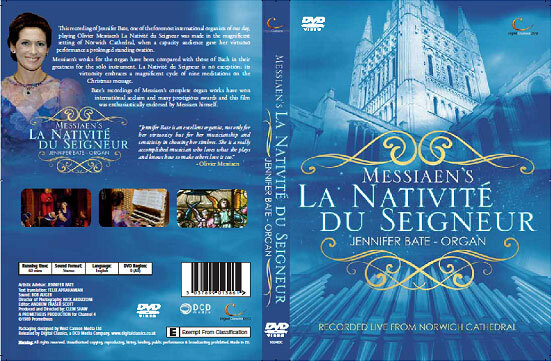 Regis Records issued, at the end of July, Jennifer's spectacular recording made at Beauvais Cathedral, with extra material by Vierne and Langlais. Their 2002 releases of her complete Messiaen and Franck recordings have received rave reviews. Similarly, her famous period instrument recordings "From Stanley to Wesley" are now again available to enormous acclaim. Organ Music by Jennifer Bate played by the composer on the organ of the Brangwyn Hall, Swansea. Despite her busy schedule, Jennifer has always been interested in composing, and frequently has been commissioned to write for special instruments or particular occasions. Recorded on one of the finest British concert hall organs, this collection ranges from the spectacular full organ to the most delicate romantic pieces. Organ Concerto with BBC Symphony Orchestra, conductor David Atherton. Jennifer Bate: incredible playing at the Albert Hall... ( Liszt's 3 masterly works ) "the range is wide and does justice to Jennifer Bate's incredible playing. She shows intimate knowledge of the Albert Hall organ's resources, finding delicate effects to counterbalance the blazing furnace of sound that closes the Fantasia and Fugue"
"Jennifer Bate's lyrical approach and sensitive registration is a constant delight, and it is a pleasure to hear the right music on the right instrument in the right hands." Plymouth Suite (1937) played on the organ of St Andrew's Parish Church, Plymouth. Five Short Pieces (1929), Four Extemporisations (1933) and Seven Sketches on Verses of the Psalms (1934) played on the organ of The Bragwyn Hall, Swansea. ASV Quicksilva CD QS 6233. Music published by OUP. Click on the CD cover to hear a sample of "Folk Tune" from "Five Short Pieces" (1929). 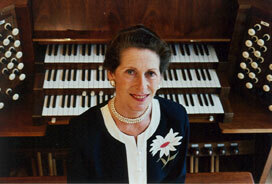 Jennifer Bate (organ). Including works by Parry, Whitlock, Gordon Jacob and C.V. Stanford. "Taut control...but there is plenty of fire and heart." All Jennifer Bate's royalties from this recording (and Vol.1: Elgar and his Contemporaries - ASV QS 6160) will be donated to the St. James's Church Organ Appeal, which was launched Spring 1999. Vivaldi Double and Triple Concertos Jennifer Bate (organ), Sarah Francis (oboe), Richard Studt (violin/director), Paul Nicholson (continuo) and the Tate Music Group. Available in signed copies at budget price (+ p&p). 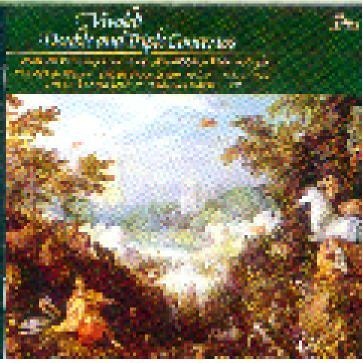 Click on the CD cover to hear part of the Concerto in C minor (RV 766) - track 15 from the CD. You can order by post, phone or fax from Les Aldrich. Most major credit cards accepted. Make out your cheque to Les Aldrich (with your address on the back please), or give your full credit card details including expiry date. Please allow 28 days for delivery. "Jennifer Bate is an excellent organist, not only for her virtuosity, but for her musicianship and sensitivity in choosing her timbres. She is a really accomplished musician who loves what she plays and knows how to make others love it too." As part of the "VISIONS - The Music of OLIVIER MESSIAEN" weekend, 15-17 January 1999, there were 3 screenings of the LWT South Bank Show (1985) where Jennifer was performer and artistic advisor. Jennifer is much in demand for masterclasses and lectures on the organ works of Messiaen. Her extensive experience of working closely with the composer gives her unique authority as an exponent of his music. During her recent study day at Cambridge University, she gave an illustrated lecture on the Livre du St Sacrement and a public masterclass for advanced students of the university. She also gave a full day of masterclasses at Christ Church Cathedral, Oxford, for the Music Faculty. During the 2008 Centenary celebrations of Messiaen's birth, Jennifer gave Festival performances at the Vienna Konzerthaus, Westminster Cathedral, Avignon (where Messiaen was born), Piacenza, the Dortmund Konzerthaus and a solo BBC Promenade Concert at the Royal Albert Hall as well as many talks and lectures on the man and his music. Many composers have written for her. Recent commissions include Peter Dickinson's "Blue Rose Variations", demonstrating her phenomenal manual and pedal technique. It was premièred in New York and later filmed in live concert at the Royal Festival Hall. William Mathias composed "Fenestra", inspired by her use of colour, and Naji Hakim wrote his "Sinfonia" with her virtuosity in mind. Jennifer Bate has given many lecture/recitals, tracing the history of music. Where no appropriate instrument is available, lectures are given with taped musical examples. Jennifer Bate's lectures on the 18th and 19th centuries are frequently illuminated by the writings of Dr. Charles Burney, whose opinion is admired to this day. During his tours of Europe, he made a fascinating account of instruments, music and musicians. The lecture is illustrated with copious musical examples, many on period instruments. "Anecdotal episodes were varied and often comical. These were delivered with perfect enunciation, tone colour and great charm ... full of interest. It was artistically enlightening and greatly appreciated"
Jennifer Bate enjoys a unique reputation as the world authority and his organist of choice. She has a series of lectures on Messiaen's Organ Works. With over 17 years of close artistic association with him, her scores contain the composer's personal nuances of interpretation. Her lecture on "Livre du Saint Sacrement" was prepared with Messiaen's advice and was approved by him. This gives a profound and exclusive insight into his most complex work for the organ. A selection of hillarious episodes in and out of the organ loft. Dr Bate enjoys working with young people and has pioneered new ways of introducing the organ and its repertoire to children. She is in great demand from all age groups for her "Young Person's Guide to the King of Instruments" - in a virtuoso demonstration of the organ revealing its awesome and enthralling power. 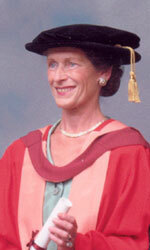 Dr Bate's educational work includes Masterclasses at Oxford and Cambridge Universities. She offers a varied series of projects for all ages, an example of which was the Millennium Organ Project, based in the North-West. This involved concertos with the Lancashire Youth Orchestras, competitions for schools, masterclasses and demonstration recitals. These events involved between 3,000-4,000 people. More recently, she has been heavily involved in a project for schools in Shropshire and the work of the Annual Jennifer Bate Organ Academy, now approaching its 12th year. Jennifer Bate is frequently an organ consultant on new instruments and organs being rebuilt. She was consultant to the restoration of the famous Harrison & Harrison organ at St. James' Church, Muswell Hill, London. In her capacity as a world authority on Messiaen, she was both consultant and performer on the South Bank Show about him. Channel Four televised her magnificent performance of "Livre du Saint Sacrement" from Westminster Cathedral and "La Nativité" from Norwich Cathedral. More recently, Italian TV made a profile programme and televised her recital at Pisa Cathedral, and her programme in St. Michael's Cathedral Barbados was networked throughout the Caribbean. and Künstleragentur Dr. Raab & Dr Böhm. Paniglgasse 18-20 / Top 14 / 1040 Wien, Austria. and Soler, Lluis & Porta Artists S.L.